British Beatles Fan Club: Trembling Wilburys Celebrate the 25th Anniversary of "Handle With Care"
Trembling Wilburys Celebrate the 25th Anniversary of "Handle With Care"
Next week marks 25 years since the release of the debut album and single by rock's greatest super-group, the Traveling Wilburys. Their iconic album "Volume 1" and hit single "Handle With Care" were issued on October 18th 1988, and still sound as fresh and original today as they did then. 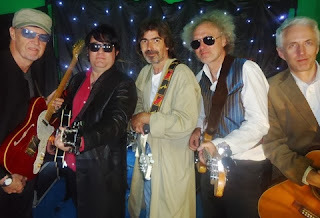 To commemorate the anniversary, tribute band The Trembling Wilburys have recorded their own version of "Handle With Care" together with a video which goes public on YouTube on Monday October 14th (see link below). The band have recreated the sound, feel and look of the original, helped by the fact that band members Glen Knowler and Dave Collison are close look and sound-alikes of their mentors, George Harrison (aka Nelson Wilbury) and Roy Orbison (aka Lefty Wilbury). Completing the band line-up are Andy McNish (Bob Dylan/Tom Petty); bassist Marko Laver (Jeff Lynne); lead guitarist Dzal Martin (who also plays with Terry Reid among others); keyboard player Howard Robin; and drummer Dave Stark (aka Buster Sidebury/Jim Keltner). The band, which has been together for two years, are also playing a couple of London gigs in the next few weeks, at London Beatles Day on October 20th, and at Regents Park Marriott for a special event on November 16th (full details below). A special Christmas gig will also be announced soon, while the band are also accepting bookings for 2014 and welcome enquiries from UK and overseas.